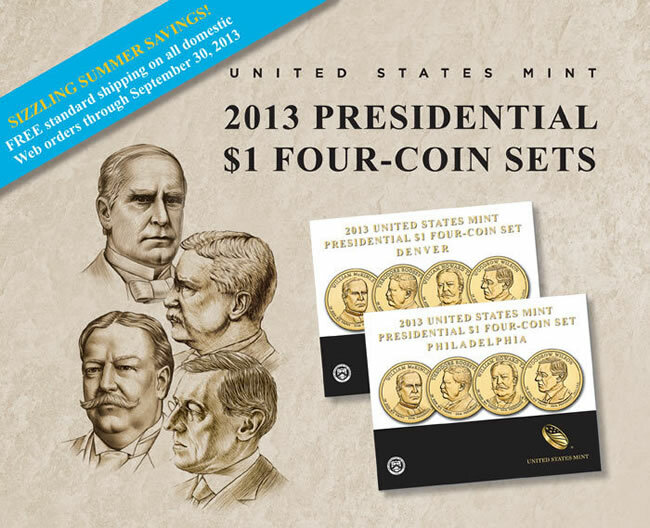 Thursday, August 15, the United States Mint released its 2013 Presidential $1 Four-Coin Sets. Buyers have a choice of two products, one filled with coins from the Philadelphia Mint or one completed with dollars from the Denver Mint. In each are circulating quality examples of this year’s $1 coins honoring former presidents William McKinley, Theodore Roosevelt, William Howard Taft and Woodrow Wilson. Written on the packaging that the coins come in is, "2013 UNITED STATES MINT PRESIDENTIAL $1 FOUR-COIN SET." It also states the coins’ mint of origin. A handy aspect of the product is its packaging, designed with coin collectors in mind. The dollars are easy to remove so that they can be placed in albums or other numismatic displays. Another nice benefit is they offer a convenient way to get all 2013 P&D Presidential $1 Coins at once without having to make separate purchases and in larger quantities. In staggered intervals each year, the U.S. Mint eventually offers dollar designs in 25-coin rolls, 100-coin bags or the 250- and 500-coin boxes. These do have heftier price tags, but on the flip side, the per coin cost of the four-coin sets is quite a bit higher. These products were introduced last year and proved popular. Both sold out with Philadelphia sets ending at sales of 17,884 and Denver sets at sales of 17,651. Each set has a price tag of $12.95. That is $3 more than last year’s 2012 Presidential $1 Four-Coin Sets, though U.S. collectors can catch a break and make the new ones effectively cheaper by ordering online and saving $4.95 — the normal cost of standard shipping. The U.S. Mint is running a free shipping promotion for web orders through September. There is a product limit of 15,000 units for the Denver set and an 18,000 unit limit for Philadelphia sets. There are no per household ordering restrictions. 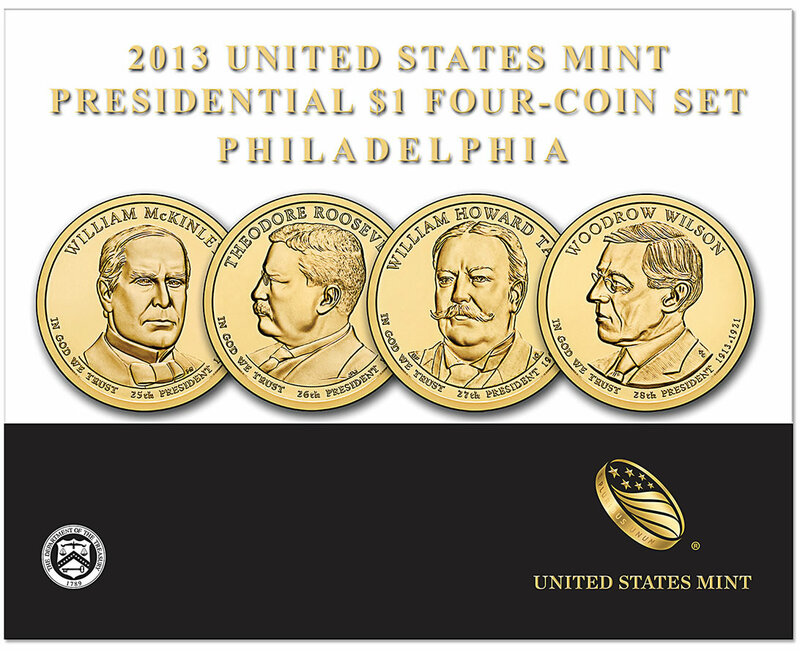 Also right now, collectors can order rolls, bags and boxes with the first three 2013 Presidential $1 Coins featuring William McKinley, Theodore Roosevelt and William Howard Taft. These products are priced at $32.95 for the 25-coin rolls, $111.95 for the 100-coin bags, $275.95 for the 250-coin boxes and $550.95 for the 500-coin boxes. Anyone interested in either of these products can place their orders online through this U.S. Mint product page, or call the toll free number 1-800-USA-MINT (872-6468). Presidential dollars that honor Woodrow Wilson are set to be released in rolls, bags and boxes in October.